Fentje E. Palit provides guidance for living a principled life. It’s a down-to-earth yet profound devotional. Within the pages of Fentje E. Palit’s new book, H.E.L.P. from the H.I.L.L.S. - Learning Christian Values through 31 Devotionals and Acronyms, ($13.99, paperback, 9781498438247; $22.99, hardcover, 9781498438254; $6.99, e-book, 9781498438261) readers will discover practical help to have a victorious life. 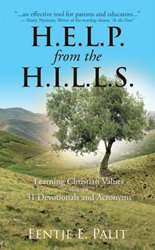 Explore what Jesus teaches on the hills through this devotional with acronyms as creative tool. Each day, learn from the biblical figures – from a humble mother who craves for help to a brave warrior who claims for the hills. Fentje E. Palit has been married for over 26 years and pastoring for over 13 years. He lives with his wife in Tanjungpinang, Indonesia. His passion is in education and he has founded a liberal arts school for over 9 years. He and his wife have two grown children. Their son graduated with a biology major from a college in Tennessee and is now a medical student in Manila. His daughter is an English major attending college in Georgia. Xulon Press, a division of Salem Media Group, is the world’s largest Christian self-publisher, with more than 15,000 titles published to date. Retailers may order H.E.L.P. from the H.I.L.L.S. - Learning Christian Values through 31 Devotionals and Acronyms through Ingram Book Company and/or Spring Arbor Book Distributors. The book is available online through xulonpress.com/bookstore, amazon.com, and barnesandnoble.com.